Since the financial crisis of 2008, lenders have become much more strict in their lending practices. New TRID rules have meant longer escrow times. Buyers get antsy. They do things that they think are innocuous while in escrow. However, they can be detrimental to your home loan in the end. Here are some common Buyer mistakes that you can easily avoid. Making Major Purchases – One of the biggest common Buyer mistakes is to make big purchases while you are still in the middle of your escrow. It’s easy to get excited and start designing your ideal kitchen or perfect living room before you’ve actually moved in. You may decide to get a jump on things and go furniture shopping now. That way, you can get rid of your old things and move in with fresh, new “stuff”. Bad idea. Many lenders will take another look at your credit score before the final paperwork is drawn up. New purchases that drive up the balance on your credit cards can lower your credit score and raise alarms to a lender. Lying on Your Application – Another one of the common Buyer mistakes made happens on your loan application. You may think that nudging your income up a little or leaving off information about certain debts won’t do anyone any harm. Lenders have become very thorough in their due diligence on mortgage loans. Besides, it is actually a crime to lie about anything on your loan application. You could face a fine and/or jail time. Changing Jobs – You’ve been at your job for several years now. Lenders like to see that. However, you’re interested in exploring other opportunities. Hold off on changing jobs until after your escrow closes. A job change is an uncertainty that lenders are not keen on supporting. Your loan could get dropped. Ignoring Contingencies or Deadlines – Contingencies and deadlines are sacrosanct in a real estate transaction. These are not to be trifled with. Whatever you are supposed to get done before the finalization of the sale needs to be done, whether that is putting financing in place or getting a home inspection done by a certain date. Start early in case there are any obstacles along the way. These are just a few of the more common Buyer mistakes that can be made before a sale is finalized. They are also avoidable. Remember, your new home is not actually yours until you sign the final paperwork and are handed your keys. Anything you do before then can affect whether or not you actually get to move in. In his annual State of the Town address on January 3rd, Mayor Andrew Skibitsky declared that Westfield is thriving. There are some exciting new residential developments on the horizon. The vibrant downtown area offers many opportunities for young entrepreneurs. This new year is shaping up to be even more spectacular than last year. One of the examples given by the mayor to show that Westfield is thriving was its AAA Rating by Standard & Poor’s last August. This is only given to those businesses or organizations that consistently show that they provide strong management and financial performance. Westfield was also recognized by NJ Family as their pick for the Best Mid-Size Town for Families in 2015. Low crime rates, fantastic schools and the abundance of neighborhoods with young families were some of the reasons that made Westfield stand out. The bustling downtown area with its combination of local boutique and larger chain stores, variety of restaurants and multitude of events also makes it a great pick for families. Another reason Westfield is thriving is because of three new residential projects in the works. A 70-unit residential complex is scheduled for the South Ave and Central Ave area. The old Jolley Trolley site is set to be converted into a 20-unit residential building with retail space. And, finally, the Planning Board is scheduled to hear more about the plans for a 31-unit residential building that is proposed to go up at West Broad St and Rahway Ave. Mayor Skibitsky was proud to note that these are all great “examples of the town welcoming private investments”. 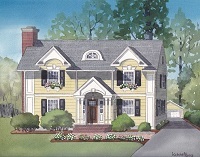 <a href=”http://luxuryhomesnj.com/blog/westfield-nj-made-the-top-100-best-small-cities/” target=”_blank”><img class=”alignright wp-image-2749 size-full” src=”http://luxuryhomesnj.com/blog/wp-content/uploads/family.jpg” alt=”Westfield NJ made the Top 100 Best Small Cities to Live list, according to WalletHub’s ranking of 1268 small US cities based on economy, health and more.” width=”200″ height=”133″ /></a>Westfield NJ made the Top 100 Best Small Cities to Live list. <strong>WalletHub recently released their list for <span style=”color: #0000ff;”><a style=”color: #0000ff;” href=”https://wallethub.com/edu/best-worst-small-cities-to-live-in/16581/” target=”_blank”>2015’s Best and Worst Small Cities in America</a></span>. </strong>Our very own Westfield community ranked 81st. Only three other cities in New Jersey found their way into the top 100: Hoboken (80th), Paramus (15th) and Princeton (1st). How did WalletHub determine their rankings for this list? There were four main criteria they took into consideration: <strong>affordability, economic health, education/health and quality of life</strong>. Things like housing costs, cost of living and how many homeowners were in the community went into the affordability portion of the equation. The economic health of a community was determined by the unemployment rate, median household income, population/income growth and how many people live below the poverty line. The quality of schools, amount of population with health insurance, total pediatricians per 100,000 people and amount of residents with a four year degree or higher determined the education and health portion. Quality of life was decided by things like commute time, hours worked per week, amount of bars, restaurants, museums, coffee shops and gyms per 100,000 people and the crime rate. <strong>Over 1250 US cities</strong> were taken into consideration for WalletHub’s list. To be a part of the deliberation, each city had to <strong>have between 25,000 and 100,000 residents</strong>. Each of the four criteria listed above were weighted evenly to determine an overall score. How is it that Westfield NJ made the Top 100 Best Small Cities to Live List? The <span style=”color: #0000ff;”><a style=”color: #0000ff;” href=”http://www.luxuryhomesnj.com/community.shtml” target=”_blank”>Westfield community</a></span> came in at 28th for its Economic Health. However, it actually ranked <strong>3rd in the Education and Health category</strong>. This was the highest of all small New Jersey cities. Only Milton MA and Lexington MA came in higher in this category. Don’t forget: <strong>the <a href=”http://luxuryhomesnj.com/blog/westfield-y-mens-club-christmas-tree-lot-2015/” target=”_blank”><span style=”color: #0000ff;”>Westfield Y Men’s Club is still hosting their Christmas Tree Lot</span></a> every night through December 23rd</strong>. If you haven’t picked up your tree yet, go to the Elm St field located between Orchard and Walnut from 5pm to 9pm weekdays and 9am to 6pm on the weekends. There’s a good chance you might even see me there wrangling trees. It’s the end of October. The weather has turned cold here in our Westfield community. It’s only going to get colder. Old Man Winter will be here in full force before you know it! Now would be a great time to check your home for air leaks. You may think you know where all the culprits are. But, are you looking for leaks in all the wrong places? You have replaced cracked weatherstripping around your windows and doors. You re-caulked where needed. You found and fixed all the obvious places where air leaks could be found. But you still feel a draft in your Westfield home. Could it be that you were looking for leaks in all the wrong places? How about checking…your bathroom! Did you know that plumbers have to cut into your sub-flooring in order to install the drain assembly for your tub? This is not a cut-to-fit process, either. The drain assembly is quite large. To ensure that they have enough “wiggle room”, plumbers will cut out a generously-sized hole that goes all the way down to the area below it. This can leave a huge hole for air to leak back into your house. It is also a great access point for outside critters to make their way inside. Most plumbers will seal the hole quickly with loose insulation. Over time, this will sag, leaving openings for air and animals to get in. You can hire a plumber to find and plug up the hole. This will set you back anywhere from $100-$150. If you’d rather do it yourself, you will need to crawl underneath your bathroom (typically, your crawl space) to locate the drain assembly hole. Cut foam board so that it fits as snug as possible around the pipes. Make sure it is screwed securely into place. Use spray foam insulation to seal up any gaps left over. Have you been looking for leaks in all the wrong places? The windows and doors are not the only places you will find air leaks. Luckily, leaks can be fixed pretty easily. Then you will stay nice and toasty this winter. And your wallet will be happy, too.